How easy is it for you to limit your screen time, or part ways with your smartphone? It has become common practice to be plugged into some form of technology for much of our waking moments. It is not unusual to see people walking down the street with their heads down, as they busily text and email. It is pretty normal to see people sitting together in a restaurant glued to their phones, while completely ignoring the opportunity to connect face to face with each other. Does this seem absurd to anyone else? How is it okay that we allow technology to get in the way of connecting with nature or one another? I have noticed myself missing opportunities to connect because I am distracted by my smartphone. In fact, I fell into the trap of using my phone for an alarm clock. Having easy access to my phone was a mistake because I would find myself checking my email or social media right before I would fall asleep, and then again first thing upon waking up. All of this ‘being on and plugged in’ is draining. When we fill the in-between spaces and quiet moments in our day with distracted time in front of a screen, we don’t get peaceful reflective time to just be. I am not sure about you, but I find quiet reflective time is how I best connect to myself and my truth. It is how I recharge and remember what is most important to me. I am not suggesting anyone go cold turkey and give up screen time all together. Technology certainly has its place and has made life simpler in many ways. It all comes down to balanced living and having a variety of experiences. We can utilize technology to learn, communicate, entertain and connect. Then we can balance that time, by regularly unplugging from technology. It is easy to recharge when we get back to basics and connect with nature, with ourselves and with the people we share space with out in the world. Investing in a regular alarm clock is just one way to limit the temptation to reach for your phone during rest time. You can also put privacy settings on your smartphone so you aren’t inundated with rings, bells and bings throughout the day and evening. Leave your phone behind while you are out with friends socializing, or turn your ringer off and put your phone out of reach. Nothing will change while you are unplugged, I can promise you that. The only thing that will be different, is you will get to connect with real human beings and share real laughter and conversation. If you are feeling especially daring, you can schedule entire days and vacations to unplug completely. Bring a regular camera to capture your special moments. You won’t regret taking a break and gifting yourself the chance to just be. 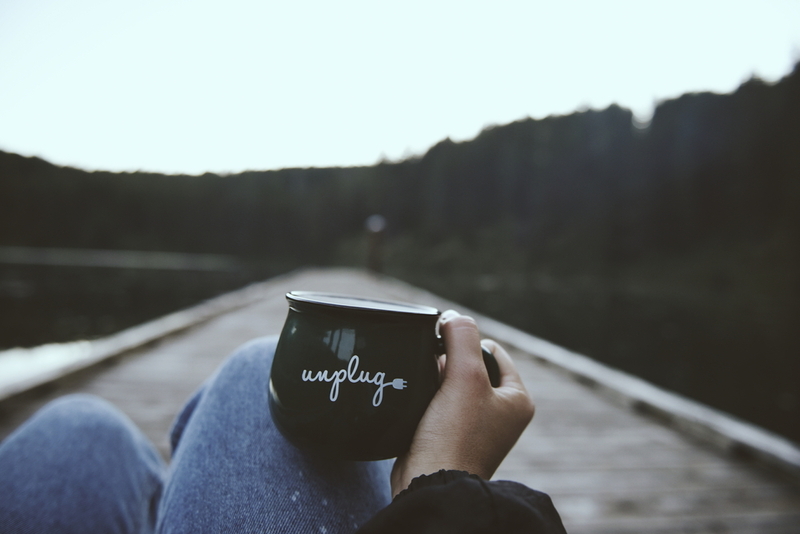 It is liberating to take time each day to intentionally unplug from technology. It can be a bit challenging for anyone who has become attached to their devices, but it is well worth the initial discomfort. You may be surprised to see what happens when you take a break and recharge your batteries the old-fashioned way. Give it a try, I dare you.